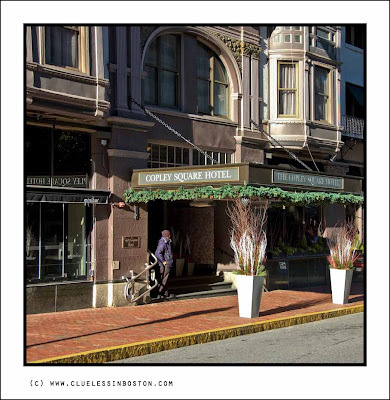 This week's doorway is the Copley Square Hotel in the Back Bay. Beautiful tone, beautiful composition. Great doorway! Typical and charming, an excellent choice for your week'd doorway. That's a smart one - though the doorman is rather oddly dressed! Very nice. I like the seasonal decorations. I think you have almost as many interesting doorways in Boston as they do in NYC!